At S-5!® we sell attachment solutions for metal roofs. But we also realize that metal might not always be the right choice. Let’s talk about how these two materials compare with one another so you can choose the right one for you. Asphalt shingle clearly dominates the steep slope and residential roofing market. Its overall market share in 2016 was 77%. This is primarily due to their low initial cost. 12 billion+ square feet of asphalt shingles are produced yearly - enough to cover 5 million homes. Metal is one of the more expensive roofing materials with a wide range of costs (and choices). It typically costs two to three times what an asphalt shingle roof costs. The Metal Roofing Alliance (MRA) estimates per square cost (100 sq. ft.) at $800-$1,200. Our own experience tells us that the cost range is much broader and more like $300-$3,000 from the lowest alternative (corrugated) to the highest (hand-folded copper or stainless). These roofs can often be installed over an existing roof, which eliminates tear-off costs and disposal. Although the Initial cost is often higher, metal roofs last over 50 years and will certainly outlast an asphalt shingle roof. Asphalt is one of the least expensive roofing material types. The MRA estimates per square cost at $350-$900. Consider this metal roof vs asphalt shingle cost comparison from Sheffield Metals: $8,737 is a mid-range cost for shingle and $17,457 is the mid-range cost for a standing seam metal roof, but when service life is considered, that $8,700 shingle roof turns into $26,211 - not to mention the mess and inconvenience of re-roofing twice. Metal roofs last over 50 years. Warranties on vertical seam metal roofs range between 30-50+ years. Many metal panels are fire-resistant. Metal also withstands extreme climates and weathering. But metal roofs must be properly installed to ensure weathertightness. Asphalt shingle roofs generally last 10-20 years. Warranties for asphalt range between 10-30 years. These warranties are often prorated, meaning the value of your roof decreases over time and so manufacturers only cover a portion of replacement cost. Asphalt shingle longevity varies by climate. Shingled roofs fare better on steeper slopes due to more efficient drainage. Low-sloped roofs are not recommended for asphalt shingles because these roofs are susceptible to the impact of driving rain, hail, and ice buildup. Shingles can be coated with leachable copper or zinc to help prevent discoloration and algae growth. Note that warranties are not always reflective of the real expected service life and some practical knowledge and experience should be involved in these evaluations. Some products are “over-warranted”, while others are “under-warranted”. The EPA’s Advancing Sustainable Materials Management Fact Sheet estimated Construction & Demolition waste at 548 million tons in 2015. (See Note at end of article for more information). C&D waste includes steel, wood, drywall/plaster, brick/clay tile, asphalt shingles, and concrete/asphalt concrete. Transparency Market Research suggests that construction waste will double to 2.2 billion tons by 2025. In 2007, the Corps of Engineers (COE) released a report on Recycling Exterior Building Finish Materials. The report discussed how multiple roof replacement made roofing one of the largest contributors of solid waste. They estimated 9 to 10 MILLION TONS of asphalt roofing waste was going to U.S. landfills. In 2019, the Metal Construction Association (MCA) estimates that conventional roofing products including asphalt shingles contribute approximately 20 BILLION POUNDS of waste to U.S. landfills annually. 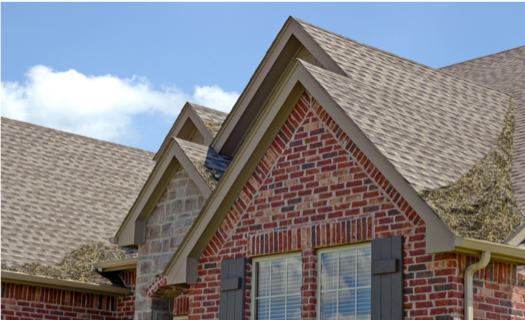 Shingles are made from crude oil, paper, or fiberglass, mineral filler/stabilizer (like limestone, or silica), and gravel. According to the Northeast Recycling Council, asphalt shingle tear-offs during manufacturing and reroofing projects produces 50 million tons of scrap each year. The average amount of debris per building tear-off is four tons. Shingles are not 100% recyclable, but shingle waste is currently being re-used in various road construction projects. A number of states have implemented their own systems for combining asphalt tear-off waste with hot-mix asphalt for paving. In Minnesota, for example, using “5 percent shingle by-product improves the performance of hot-mix asphalt, and is cost-effective, with potential cost savings from $0.50 to $1 per ton.” The company behind the project, Bituminous Roadways, currently uses 25,000 tons of shingle scrap. Metal roofs can be installed over an existing asphalt shingle roof and by some model codes even over two shingle roofs. But it is critical to ensure no moisture gets trapped between the two materials that could cause mold and rot. 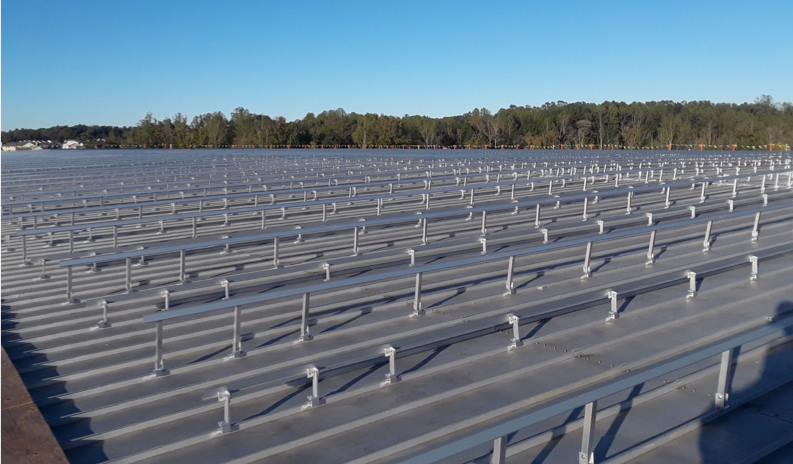 Metal roof installation requires an experienced contractor to avoid mistakes because, often, any structural issues that arise with a metal roof tend to stem from installer error. In handling metal panels, installers must be very careful not to scratch or dent the panels when fastening and adding flashing. During installation, traversing the roof requires some care so as not to damage the panels. It’s sometimes possible for a new roof to be installed over an old layer of asphalt shingles if loose shingles are removed and new roofing felt, and underlayment is applied – to eliminate moisture getting trapped as well. Shingle installation is typically straightforward and generally less labor-intensive for contractors. Prepackaged shingles save time. Issues that arise with individual shingles can be solved at the moment of installation and repaired or replaced. During installation, contractors can crisscross the roof with a bit less worry about damaging the already installed shingles. Metal roofs are generally maintenance-free, save for removal of branches and leaves and other debris that might collect on the roof and gutters. Specific roof profiles have less maintenance requirements (e.g. standing seam requires less maintenance than exposed fastener). Metal roof color can fade over many years of time but can also be repainted. Premium coatings and paint varieties generally warrant against excessive fading or chalking (oxidation) for up to 35 years. Shingle roofs also collect leaves and debris and must be cleaned out periodically – at least once a year. Asphalt shingles must also be re-caulked and sealed as the roof ages. Early metal roof construction entailed no noise-reducing underlayment material or insulation and were simply nailed down to wood framing. Today, roof decks are added to the rafters before the metal roof panels are installed. Attics and cathedral ceilings are also well insulated. Metal roofs placed over asphalt shingles add an additional sound barrier as well. According to a study done by the Acoustic Group at the University of Luleå, Sweden, metal roofing is no more or less noisy than other roofing material types. Construction is key in sound magnification. Open framing will yield louder roof noise during a rain storm than installation over a solid deck. A metal deck installed over open framing is about 61 decibels. Normal conversation is around 60-70 decibels. The Acoustic Group determined noise level in decibels of rain on metal roofs and on shingles. They determined the sound of asphalt shingles to be 46 decibels and metal to be 52 decibels. In context, the lowest sound that humans can register is 0 dB and the loudest is over 175 dB. Humans only distinguish sound variation when the increase is more than 8 dB. For an exposed fastener roof, penetrating it may be necessary, so when mounting to this type of roof, proper weatherproofing must be done to ensure no leaks develop that may cause corrosion. If mounting to a concealed fastener roof, non-penetrating roof clamps can be utilized that provide a secure point of attachment without violating the warranty of the roof. 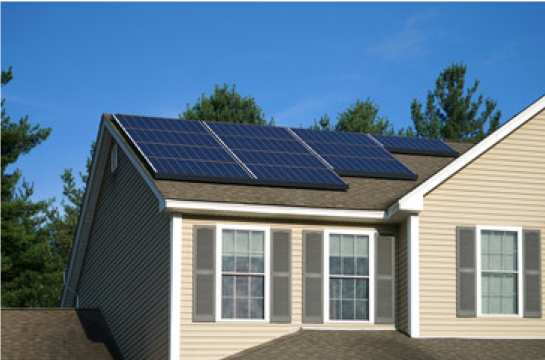 Solar panels are one utility example that can be easily mounted on metal roofs—and at lower costs than on shingle roofs. 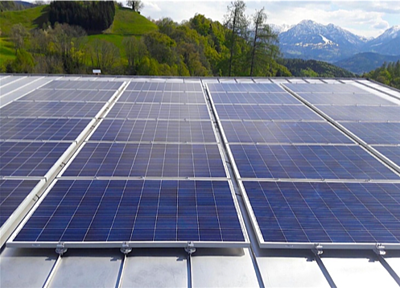 Photovoltaic arrays have an extended service life exceeding 30 years. 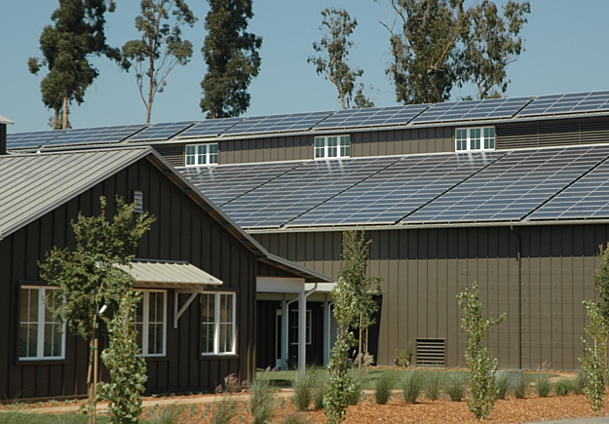 A metal roof will last as long or longer than the solar array installed above it. PV can be mounted to standing seam metal roofs with no penetration whatsoever. Other rooftop utilities can also be installed using non-penetrating clamps. For exposed-fastened roofs, self-sealing brackets attach directly to (or through) the panels. 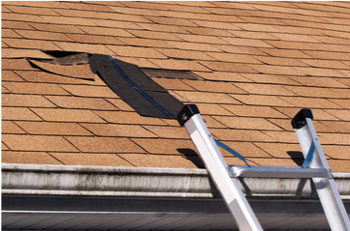 Various utilities can be mounted to an asphalt shingle roof; however, penetration of the roof shingles is always required. Sealant and waterproofing steps must be taken to help prevent moisture from getting below the shingles and causing problems. Special flashing details are required for code compliance. 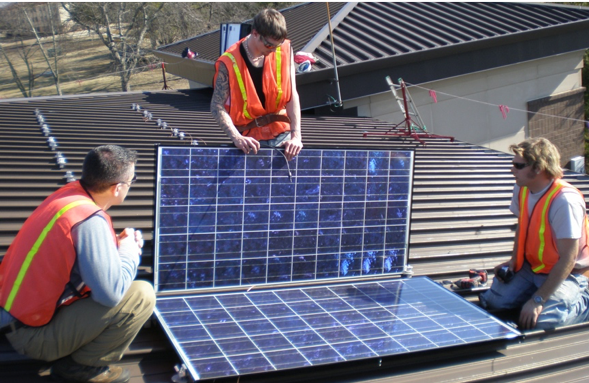 Installing solar panels on an asphalt shingle roof is commonplace with required penetration and flashing details. But re-roofing will mean having to pull off the solar panels, performing a reroof, and then a reinstall of the panels. Asphalt shingles support other utilities too. Again, secure attachment is typically accomplished by penetrating the roof with mechanical anchors into the structural rafters or deck as previously described. Metal roofs come in an endless variety of colors from earth tones to bright, clean blues and greens. They offer distinctive raised (standing) seam, trapezoidal rib, corrugated, and other formed patterns across the panels. Metal roofs generally have glossy finishes, but they are also available in low gloss and even stone-coated products that look just like shingles. Stamped metal panels (or metal shingles) can imitate the look of asphalt, wood and slate shingles and other roofing styles and also come in various shades and colors. Asphalt shingles maintain a very traditional roofing style pattern for houses. Limited color shading is available. They are available in lightweight 3-tab styles and heavy “architectural” styles. What is the best material for your roof? No doubt a multitude of factors exist to help you determine what works best for specific projects. From aesthetics to functionality, durability to cost, choosing the right material for your roof is a big decision. If you are looking for a low initial cost, then choose a lower grade asphalt shingle roof or utilitarian metal. If you plan to own your home for a longer period of time and don’t ever want to have to replace the roof, then mid-grade or standing seam metal roofing would be a better choice because it offers longevity, durability, lower long-term ownership cost and ultimately is the best value. At S-5!®, we help to make metal roofing the most desired, accepted, sustainable, and user-friendly roof in the construction industry. We don’t sell or manufacture metal roofs. But we make it easy and prudent to secure things to these roofs with our non-penetrating line of clamps and self-sealing exposed fastener/trapezoidal roof bracket solutions. If you think a metal roof is the right choice for you, check out our extensive snow retention, solar, and utility attachment solutions to securely mount almost anything to your new metal roof. Our principals have been in the metal roofing industry for almost 50 years and design products to last the full life of the metal roof to which they are mounted. (Note:The Fact Sheet helps assess the national waste stream and measures recycling and management programs. The EPA collects and reports on the generation and disposal of municipal solid waste in the United States. Each Fact Sheet is based on the most recent and most complete information available. Its 2018 report utilized facts and figures from 2015).